Upgrade your flight simulation experience with the Saitek Pro Flight Throttle Quadrant. 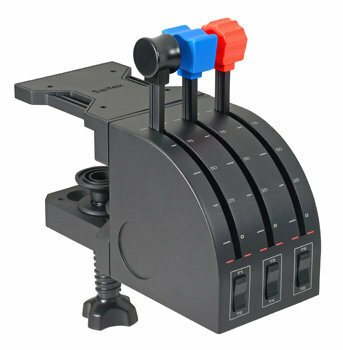 This makes an ideal addition to the Saitek Pro Flight Yoke System to expand the number of controls for your flight simulation setup. Set the levers to control aircraft throttles, adjust elevator trim, fuel mixture or even to engage reverse thrust during landing. The Pro Flight Throttle Quadrant will work in any major flight simulation to give you all the control you need. Review: It met all my expectations. I added this controller to my system for dual engine control. Very nice. Pros: Reacts good, and I like being able to switch knobs. Review: I like the product, but the stems of the leavers are too fragile. Have broken one already. Review: When first purchased, the throttles performed as expected. However after about a year of use, the throttles tend to spike and jump regardless of setting. Especially irritating if you're cleared for takeoff, add power and hear "reverse thrusters engaged" from FSPax. I guess nothing should be expected to last forever. I have their switch panels, pedals and yoke. They all still work great. But the throttles are my bane!! Review: Finally got round to buying the second quadrant. Should have done it long ago. Makes flying twin engines seem a lot more realistic and steering on ground is much easier. Only issue is getting it configured. Supplied documentation is near useless. Get FSUIPC (paid version). Its not expensive and the momey spent on it will be worth it however there is not much documentation for that either but it is fairly intuitive and I figured it out so cant be too hard. I also find it works ok via the USB port in the saitek yoke whereas other panels with illuminated displays dont work as they draw too much power. Review: I picked up a stand-alone quadrant to work with the one that came with the yoke -- to fill out a panel for a DC-3. Am pleased with my purchase, although I have already had an intermittent spiking problem with the #1 throttle. I have an idea for an "outboard" add-on with three industrial quality pots from Allied and am hoping this will permanently correct the problem. Review: My only issue is when you buy throttle levers to replace the silly ones that come with it, the tension on a small spring inside is not strong enough to hold with heavier new throttle levers! Cons: Poor quality pots that need cleaning or replacement after constant use. Q: what connector does this quadrant have. I need the quadrant with usb connector. A: This uses a USB connection. Q: My son has a yoke and rudder pedals from CH products. Would the Saitek Flight Throttle Quadrant work with these other brands' components? Thanks! A: Yes, this will have no problems working with a CH Products yoke or rudder pedals. Q: Can these be stacked for a multi engine setup? A: Yes, you can definitely set up multiple Throttle Quadrants to work with each other and simulate multi-engine.